The Old Police Station building dates from the 1860s and is the perfect home for an antiques centre with eight unique rooms set over two floors. 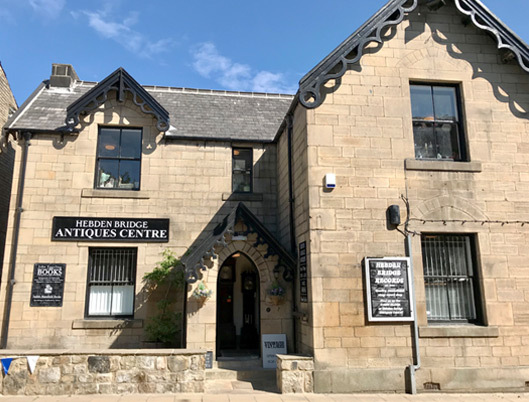 Since 2007, Hebden Bridge Antiques Centre has been a popular destination for everyone from locals and day-trippers to walkers and long-weekenders visiting the picturesque market town of Hebden Bridge. Initially situated on Albert Street, the terrible floods of Boxing Day 2015 meant we were forced to move to alternative premises on Valley Road. We spent two happy years on the other side of town, but although the building was spacious and accessible we always felt it was missing a little something. So when the opportunity arose for us to renovate and refurbish The Old Police Station building on Hope Street in the centre of Hebden Bridge, we just couldn’t say no. Built in the 1860’s, The Old Police Station was home to the local police force until it closed permanently in 2012. Despite its attractive exterior and central location, the building stood empty for five years until we began to bring it back to life. Our extensive renovations included laying new flagstone flooring and exposing some original brickwork to complement the existing original features of the building. Although it took months of planning and hard work, we moved into our brand new permanent home Thursday 1st February 2018. Now with eight rooms spread over two floors, the finished building is smart, quirky and unique – the perfect home for an antiques centre. Here at Hebden Bridge Antiques Centre, we’ve got a passion for all things old, antique, vintage and retro. With around 45 dealers in our centre, we specialise in everything from art, books, curios, collectables, homewares, furniture, glass, jewellery, pottery, records and more. In short, we have the best of everything the antiques trade has to offer. Our centre is also home to the famous Hebden Bridge Records, run by the friendly and knowledgeable Dan. With a vast and eclectic selection of records covering everything from folk and jazz to blues and rock & roll, Dan brings in new stock every week and is always happy to meet fellow music fans. You’ll find us at The Old Police Station, Hope Street, Hebden Bridge, HX7 8AG (we’re opposite the library and just across the road from the cinema). We’re open every day from 10.30am to 4.30pm (including Bank Holidays) and if you’re visiting with a four-legged friend then don’t worry – well-behaved dogs are always very welcome in our centre.